In the first article I traced the progress of the Leicestershire census enumerator around Appleby Parva, past the Hall and School and along Over Street (now Top Street) as far as the Particular Baptist Chapel at Brook(s) End. His route is resumed at that point. As explained in Part 1, the locations of householders are deduced by comparison with the 1831/32 Reference and Map of the village. As before, key to the properties given below in square brackets gives [1831 Ref. No., Type of property, Owner/s]. The squire George Moore is abbreviated to GM. ‘ag lab’ means agricultural labourer. 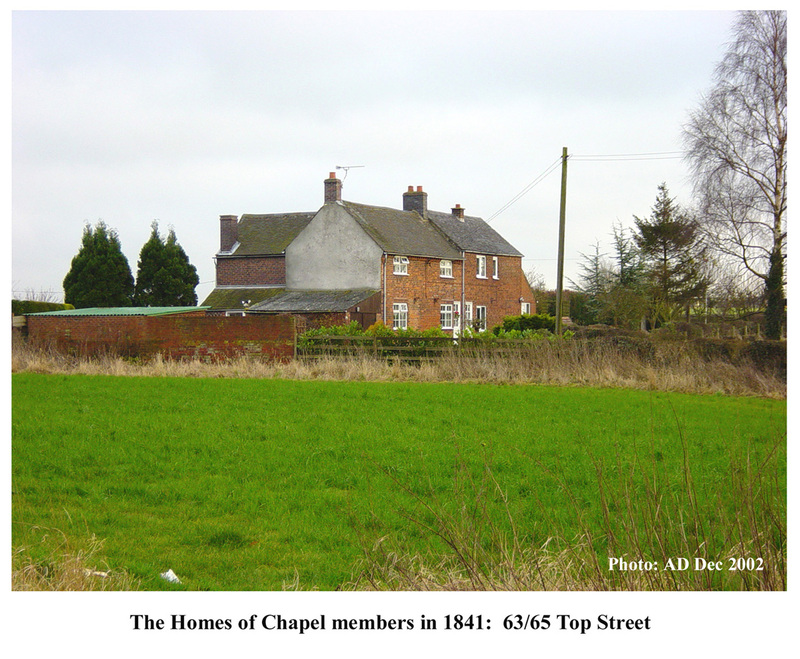 The chapel House at Brook(s) End [287,H,Baptist Society Trustees] was occupied by William Edwards (55) Baptist Minister, his wife and a servant, Louisa Pocock (38). The Chapel had been opened in 1826 (1). Nearby (at 63/65 Top Street) was a group of five cottages [461,5c,Geo.Haywood, Mr Clamp & GM]. Two cottages, facing the chapel were in Leicestershire. The others were behind and in Derbyshire (for the county boundary line see the map). In 1841 these housed John Rowland (30) ag lab and his family; Hannah Clamp (66) poor widow with Thomas Haywood (54) ag lab and Richard Healy (70) stocking maker; Samuel Haywood (35) ag lab and family; and William Wyatt (30) ag lab and his family. The fifth house stood empty. 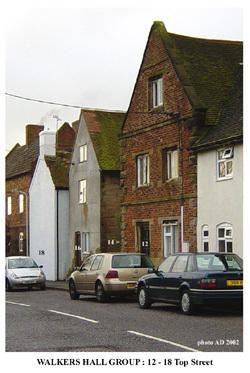 It is not possible to say precisely who lived in which cottage, but the 1831 Reference has John Rowland and H Rowland living in the two Leicestershire cottages, ie facing the chapel, and Hannah Clamp, S Haywood and Dorothy Rooker in the three Derbyshire ones at the back of the group. The Rowlands and the Haywoods were Baptist families and it seems possible that all the families living here were Baptists (2). Continuing northwards up Over Street, on the left (west) side was a crowded complex of cottages [290-295]. This is a difficult area to sort out because many of the properties were unoccupied in 1841. Indeed three cottages well set back from the road [295,3c,George Cooper] were already empty in 1831. It seems likely that the housing was of a poor standard and due for demolition and/or replacement. All of these cottages stood in Leicestershire. What can positively be said is that one of the pair of cottages [294,2c,Joseph Wyatt] was occupied by Sarah Radford (40) a widow with two children. Mrs Radford was another Baptist (3). Of the adjacent cottages facing the street, one of [291,2c,Mary Wyatt] was occupied by John Mortimer (50) ag lab with his wife and six children. The other was probably empty. The cottage [292,c+shop, James Wyatt jun.] may have been occupied by George Wyatt (50) shoemaker with his wife and children. Mr Wyatt’s workshop was close to his cottage. The next cottage [293,c,GM] probably stood empty. Alongside the street the detached cottage [290,c,Own] was occupied by James Wyatt sen. (70) farmer, his wife and family. This survives as 56 Top Street. Also listed in this area in 1841 were Richard Kendall (25) bricklayer his wife and young son; and James Blood (30), ag lab, with two sons aged 8 and 5 years. With the housing here clearly in a state of change, it has not been possible to locate their homes. The next properties of Over Street, moving up the street, were in Derbyshire, although (as explained in the first article) listed by the Leicestershire enumerator. The first of these [318,c,GM] was probably the home of Thomas Chapman (60) farmer, his wife and daughter. Nos 50 and 48 now occupy this part of Top Street. 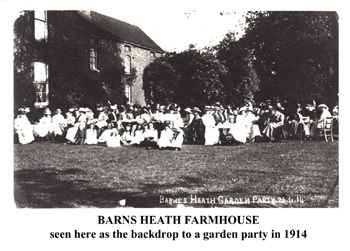 Next followed the Farm House [319,FH,GM] of John Boss (50) farmer, his wife three children, Elizabeth Pratt (70) independent; and two servants: Frederick (20) and Ann (18) Wileman. Now No. 44 Top Street, this house was until recently known as Home Farm. Across the road in 1831 lay two cottages [457,2c,Thos. Boss senr] occupied by Edward Saddington, Hugh Mould and William Proudman. Presumably one of them was divided. By 1841 they had become four households. 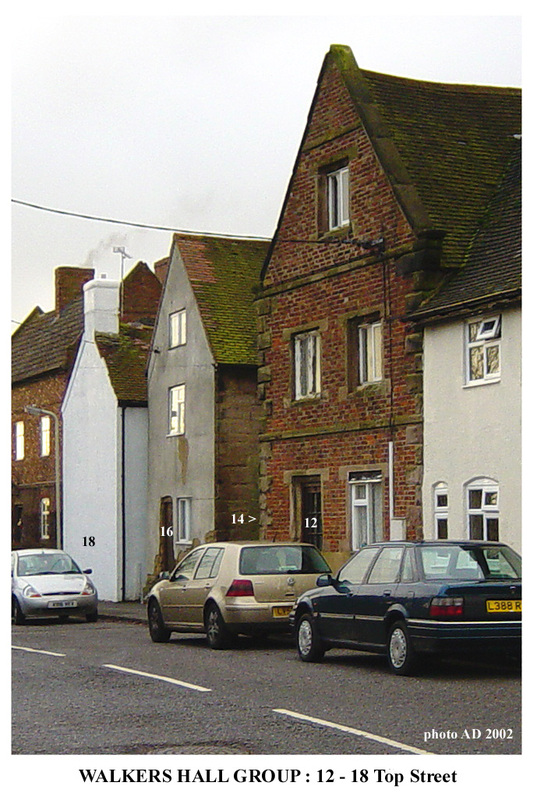 These cottages were listed as part of Over (Top) Street, but we now regard them as being in Botts Lane - Nos 2 and 4. Living with William Proudman (62) ag lab, were Elizabeth (58) and Emma (11) as well as Elizabeth Swain (47) and John Wilkins (65) ag lab. With Edward Saddington (30) harness maker, were Eliza (25) and two young children. James Waterson (70) ag lab and Ann (66) also had John Walton (12) living with them. Hugh Mould (35) carpenter and Sarah (30) had four children. It appears that between 1831 and 1841 the cottages were extended and/or divided to make four separate houses. 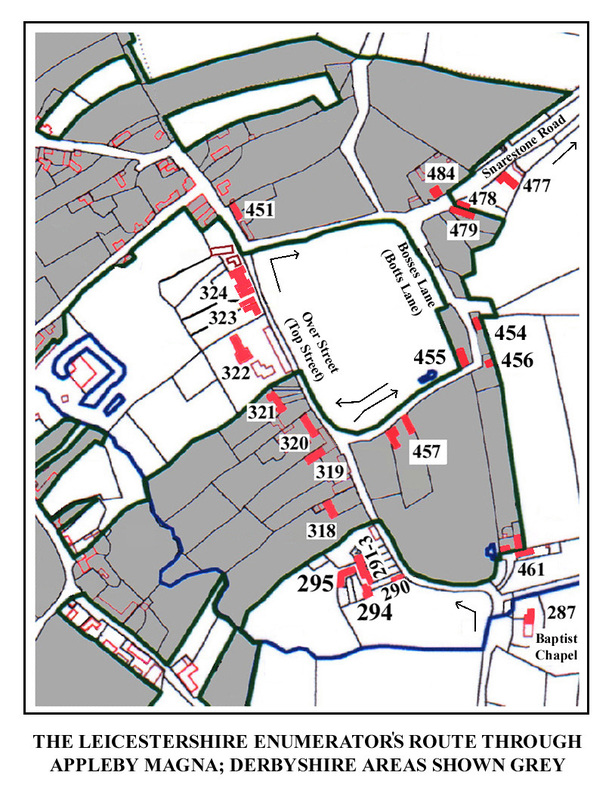 The enumerator made a detour into Bosses Lane where all the cottages were also in Derbyshire. (John Boss lived at  and Thomas Boss owned  - see above.) 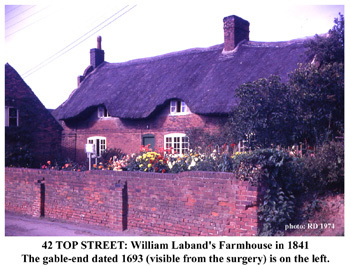 The cottage on the outside of the corner, now No 16 Botts Lane, [456,c,Own] was the home of Samuel Haywood (63), ag lab, Elizabeth (60), Hannah (35) and Hannah (3). On the inside of the corner, on the site of No 17 Botts Lane, stood the cottage [455,c,-Brewood] where lived William Jordan (38) ag lab, Sarah (40), their six children: Alfred (14), William (12), Emma (9), Ann (7), Sarah (5) and George (3), and another Sarah Jordan (5) perhaps a cousin. A little further up the lane, on the site of No 22 Botts Lane were three cottages [454,3c, Joseph Wyatt]. Thomas Ward (30) potter, Matilda (30) and five children lived in one. A second was probably occupied by Thomas Pickering (65) ag lab with three children; and the third was the home of John Wyatt (40) bricklayer, Jane (35) and a young son. The enumerator returned to his main route in Over Street at the home of William Laband (60), farmer, and his family [320,FH,Mrs Mary Mould]. This is the one surviving thatched house in the village, No 42 Top Street. Its south-facing brick gable-end shows the date 1693 as a pattern in the brickwork. The construction of timber-framed houses with brick chimney stacks, often incorporated in a whole gable wall, was a not uncommon practice in the latter half of the 17th century (4). The next group of four cottages [321, 4c, GM], now 40-34 Top Street, were occupied by Emma Parr (55) and family; William Orchard (41) bricklayer with Elizabeth (41) and 5 children; Ann Smith (85) and Ann Ward (65) both poor widows with Mary Parker (45) and Rebecca Haycock (39) cotton spinner; and William Boss (39), painter, with Catherine (40) and six children. Passing back into Leicestershire, the next house [322,H,Mrs Mary Mould] was occupied by Thomas Wyatt (40) farmer with Ann (35), Mary (60) 3 children and 3 servants. 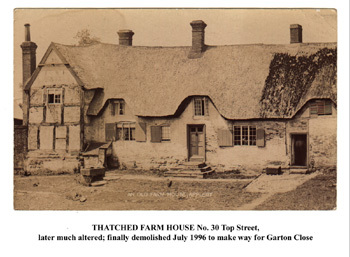 Once a picturesque, if dilapidated, thatched farmhouse, No 30 Top Street underwent extensive reconstruction before finally being demolished in 1996 to make way for Garton Close. The barn alongside the street contained a stone with the date 1724, but the original timber framed farmhouse must have been older than this. 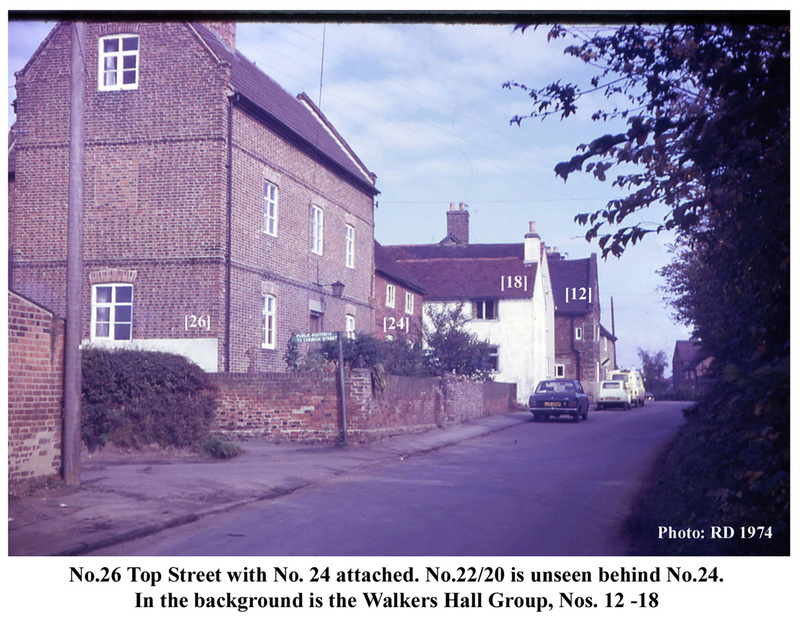 The next two groups of properties [323,5c,GM] and [324,FH+3c,GM] cluster around two substantial houses: 26 Top Street also known as Eastgate House; and 12-16 Top Street, known as Walkers Hall. In 1831, Nos. 20-24 appear to have been grouped with No 26; and No 18 with Walkers Hall. The stone lintel over the front door of No 26 is inscribed with the date 1720. Walkers Hall may be 17th century (5). The group  comprised Nos. 26, 24 and 22 (incorporating 20) Top Street. As these were described as five cottages in 1831 and the five 1841 householders match the 1831 occupants exactly, the back of No. 26 may have been used as a separate dwelling. The occupants of these cottages in 1841 (probably in the sequence of the houses Nos. 26 - 20) were: Henry Lees (50) draper with Mary (50), two children, Mary Wileman (15) dressmaker and Catherine Grimley (15) servant; Maria Mould (70) independent living alone; Joseph Waterman (40) ag lab with Hannah (30) and 3 children; Thomas Cooper (45) ag lab, with Elizabeth (39) and 4 children; and Ann Brookes (50) shopkeeper with Thomas (20) carpenter and 3 younger children. The Walkers Hall group  comprised Nos. 18, 16, 14 and 12 Top Street. 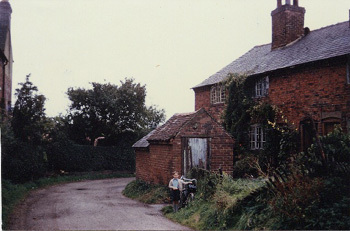 A farmhouse with 3 cottages in 1831, although one stood empty, it had three householders in 1841. The precise arrangement of the households is therefore not clear. In 1841 the householders were: Thomas Bowley (35) bricklayer with Ann (30) and 4 children; Thomas Boss (40) farmer with Catherine (40), 4 children and 2 servants; and James Waterman (50) rag gatherer with Mary (50). The enumerator then crossed the street into Derbyshire once more to the cottage [451,c,Mrs George Moore] where lived William Bradbury (55) blacksmith with Faith (60). This is now No. 3 top Street. Also lodging in this cottage were Thomas Tompson (25) veterinary surgeon, William Parker (20) cooper and William Miller (69) ag lab. The route now followed the Snarestone Road to [484, H,Own] occupied by Thomas Tunnadine (74) cooper with John (29) butcher and Ann Henshaw (56) servant. In 1841, another house was under construction (‘building’) nearby. These houses were close to the present Jubilee Farm. On the opposite (south) side of the road, in Leicestershire, was a cottage [478,c,GM] occupied by Elizabeth Whewell (62) and Mary Stubbs (42) both poor widows. This is probably now No. 24 Snarestone Road. With them lived William Stubbs (12), Mary Norman (35) cotton spinner and Ann Rowland (14). No mention is made of any occupants of the nearby range of 4 cottages [479, 4c,GM] (in Derbyshire) which were in the possession of the squire and crossed out on the 1831 Reference list, probably indicating demolition. The remainder of the enumerator’s route was entirely in Leicestershire. Further along the road was [477,4c,GM], now No. 28 Snarestone Road. These four cottages were occupied by: George Haywood (25) ag lab with Ann (32) and Ann (2); William Rowland (30) ag lab with Elizabeth (30), 4 children and Ann Wilkins (78) poor widow; William Bowley (42) ag lab with Elizabeth (37) and 4 children; and John Wilkins (39) ag lab and Dorothea (44). 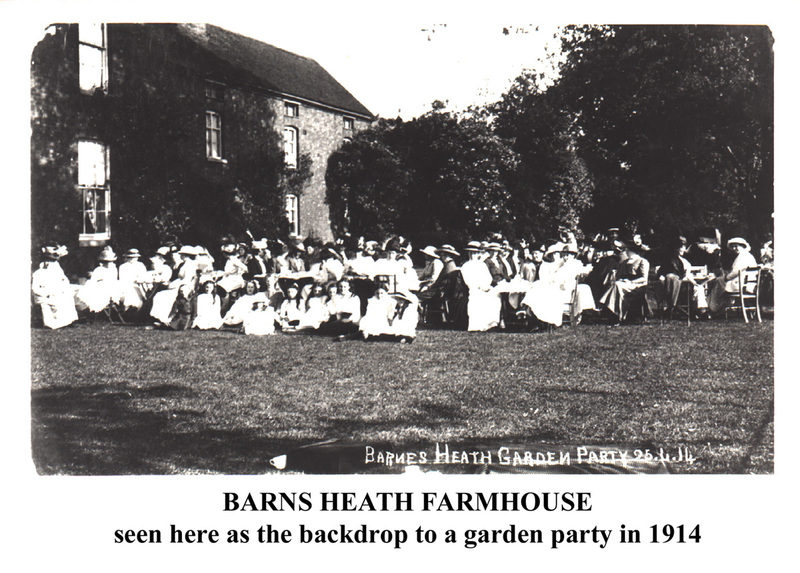 Barns Heath farmhouse [598,FH,GM], at SK 328 10, was occupied by Thomas Foster (45) farmer with Elizabeth (35), baby Elizabeth (3 months) and 3 women- and 4 men-servants with ages ranging from 10 to 25 years. Two other households were also nearby, probably at Far Barns Heath, SK336 099, near the parish boundary with Snarestone. In 1831 this was described as a farmhouse with outbuildings and garden [667,FH,GM]. The two householders who were probably there in 1841 were: Vincent Baily (40) gamekeeper with Mary (40) and 7 children; and John Godfrey (57), ag lab, with Dorothea (55), and Sarah Cresswell (35) with Sarah (1). These remote houses do not appear on later maps. Next on the 1841 list is the cottage [738,c,GM] on Snarestone road by the windmill site, at SK 325 095. Living here was Mary Jackson (40) poor widow with two children, Ann Grimley (43) also a poor widow with Sarah Cooper (13). The occupant in 1831 had been Ann Jackson. A windmill for use of the parish had been built by subscription in 1802, but there is no evidence of a miller here in either 1831 or 1841 (6). Upper Rectory Farm [716,FH,Rector] at SK 325 087 was unnamed in 1831 but occupied by J Whitehurst. In 1841 it was called Appleby Field and John Whitehurst (55), farmer, was the householder. With him were Mary (30) and four young children. There were also young servants: 3 male and 2 female. The last call made by the Leicestershire enumerator in the outlying parts was to the Appleby Hall Keeper’s Lodge [818,c,GM], close by Stoney Way plantation at SK 315 084, where Henry Allwood (35) gamekeeper lived, as he had done in 1831. With him were three Allwood children Jane (10), John (7) and Ann (4); and Hannah Stimson (25) servant (7). In the next article I shall start to look at the Derbyshire enumerator’s returns for his part of the parish. 1. Appleby Particular Baptists Church Book, LRO, DE3431. 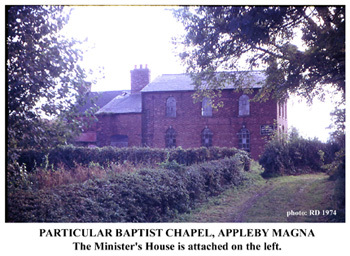 I shall write about the non-conformists of Appleby, especially the Baptists, in a later article. Brooks End, named in the 1841 Census, is called Brook End in the 1831 map reference. 3. Appleby Particular Baptists Church Book, op cit. Her husband George Radford died in 1834. He had been briefly Writing Master at Appleby Grammar School, until removed because his Baptist activities were deemed incompatible with the school statutes. 7. Appleby Parish Registers record that ‘Hannah wife of Henry Allwood of Appleby’ was buried on May 15 1839.